Second things second, can I take a moment to exhale? After that, I'd like to curl up in a fetal position and rock myself back to calmness. OK, now I'm ready: Christ almighty, "Petty Cash" was another absolutely brilliant episode. (Can we just assume that every episode is going to get an "A" from here on out, so I can stop going through the motions of grading?) After a few good but not great episodes at the beginning, this season is shaping up to be truly remarkable. We're down to the final two episodes, and unlike practically every other TV show I've ever loved I have complete confidence that The Shield will end spectacularly. Honestly, there is not a single doubt in my mind that what I'm seeing is one of the great TV cop dramas ever go out with its very best episodes. Where we're headed seems pretty predictable–Vic, Ronnie, Shane, and Mara appear more screwed than ever–and yet learning the "how," "what," and "when" has been positively heart-stopping. 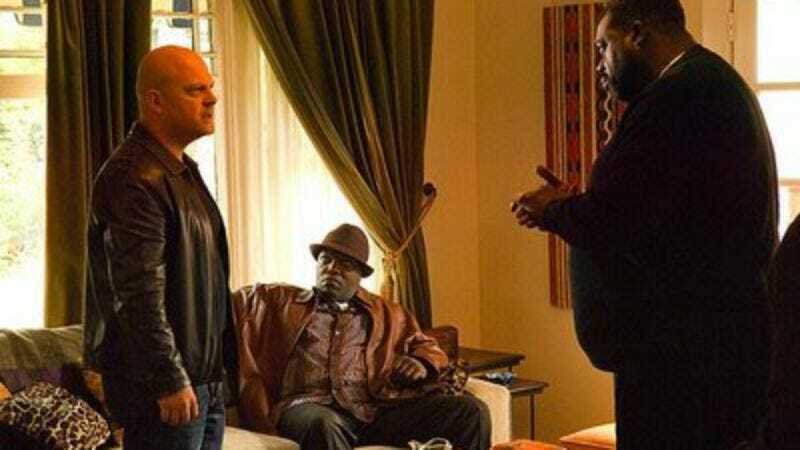 So, basically, we saw Vic and Ronnie struggling to pull off a classic Strike Team scheme involving a drug deal between Beltran and the black gangs that will help them land an undercover deal with ICE. Meanwhile, Corinne and now Julien are in on Claudette and Dutch's sting operation, which went sideways when Ronnie was sent to deliver Shane's payoff cash while Corinne was under surveillance. (Ronnie's fate was quietly sealed with that one.) And Shane and Mara continue their doomed descent into Hell as a white trash Bonnie and Clyde, perpetrating the funniest/saddest robbery of the series. Now we're poised for the increasingly desperate principals to finally get brought down or killed next week, in the second to last episode. Even fans of The Shield have complained that the show has sometimes stretched the limits of plausibility, but now that the protective "shield" of being a cop has been stripped from The Strike Team we are seeing how difficult it really is to pull off the capers they routinely perpetrated before. One of my favorite things about how The Shield is coming to close is how systematic the writers have been about exposing how weak these guys are without the protection their status affords them. They aren't cops, but they still see themselves as strutting "action heroes," as Vic put it to Beltran in the episode's most incredible scene. "The edge is where we live,' Vic says. "People try to convince themselves otherwise, but it's just an exercise in self-deception." In this scene, Vic is trying to prove he's on the level to Beltran by acting cool about a drug deal with a vicious gang, but this statement reflects his actual worldview. Vic's life is all edge, just as all of his decisions ultimately come down to his survival versus somebody else's. The irony is that Vic is the self-deluded one. Most people don't live on the edge. They don't rob criminals or kill their co-workers. Vic is not normal; he also is not an action hero. He's a dead man walking, constantly bargaining with Ronnie for "just a day or two" to straighten out a mess that won't ever wash away. The Shane and Mara scenes tonight had the same feeling of tragic inevitably they did last week during the terrific "grill out" sequences in "Party Line," particularly the moments when they seemed to forget just how unlikely a happy ending is for them. Their story culminated in the robbery of Mara's workplace, which I hope gets funnier and less pathetic upon second viewing. Otherwise I don't think I could take it again. I loved that Shane couldn't figure out how to turn safe wheel, but when one of the hostages offered to hold Jackson while Mara cleaned out the checks, the lump I felt in my throat wasn't a chuckle. If Shane doesn't finally get busted next week, he's going to be selling his plasma for gas money. Away from the Vic-Ronnie-Shane business was Julien, who was given his best (and probably final) storyline in a long while, as he investigated the death of a high school football star from his neighborhood. I was a little surprised by how quickly he agreed to join in with Claudette and Dutch against his partners in The Strike Team, but Julien has always been one of the only pillars of decency in the barn. He's like a marker that shows how high the slime goes, and while there's a part of me that dreads what's coming for Vic and Shane I was reminded by Julien's eagerness to bring them down that justice will, and should, prevail in The Farm very soon. –I love watching these guys work without their shields. Ronnie is so desperate for intel he's enlisting Billings to do his dirty work, which of course ended up being a well-played disaster. —My man Van Bro joined the list of memorable guest stars making one last turn in the final season. Can Anthony Anderson be close behind? —What is the deal with Claudette? Is the hunt for Mackey going to kill her? —Tonight's episode was directed by Craig Brewer, the maker of Hustle & Flow and Black Snake Moan. — Where do you guys stand on the sympathy issue? Do you feel sorry for these guys? I know I shouldn't but I can't help cheering Vic to get away with it one last time.